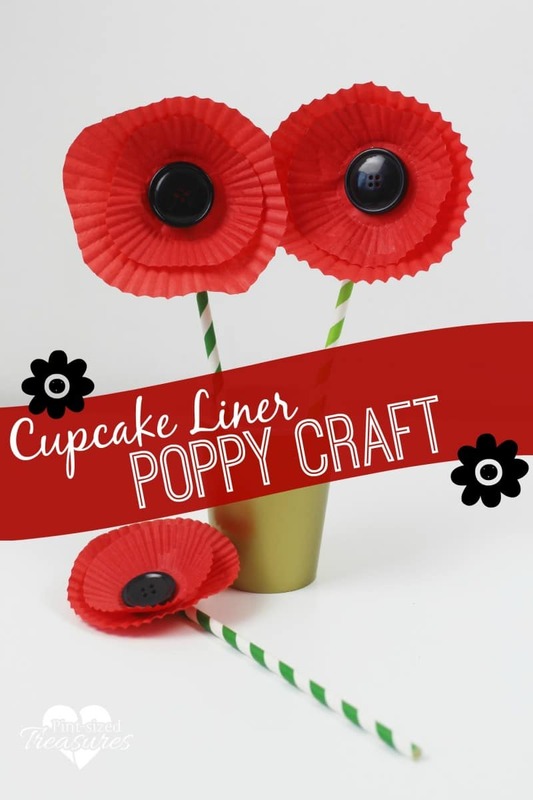 This easy cupcake liner poppy craft is perfect for little hands! Just last year I learned just how important poppies are to certain countries. just like them, i use crafts (Like these patriotic bubble blowers) to teach my kids about their country’s history. But I like to keep crafts simple. That way it never gets too stressful trying to fit them into a busy mom’s schedule! And the fewer materials the better! Paper Poppies are Great for Gifting! 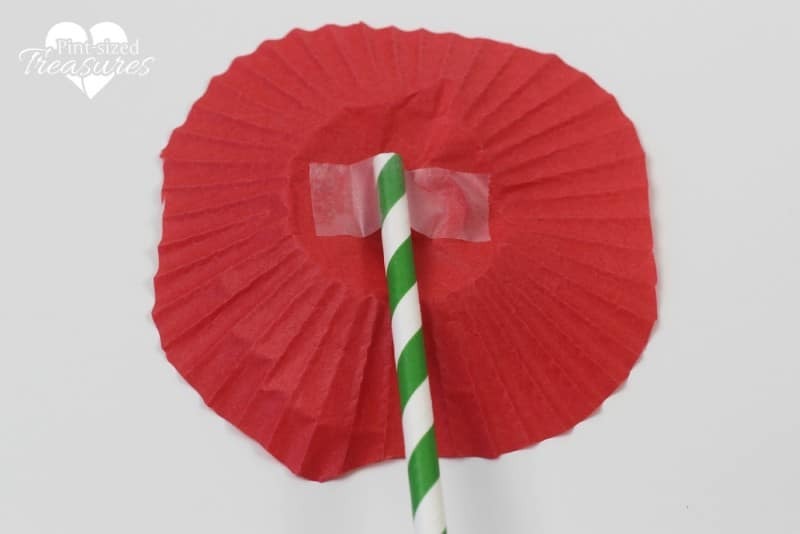 These cupcake liner poppies would add a big pop of color to a homemade cards for friends, family or neighbors. We even used cupcake liners to make colorful spring flowers too! However you choose to craft with poppies, you are sure to make someone smile or even touch their heart as they celebrate Remembrance Day. Want another poppy craft idea? Check out this adorable poppy bunting that’s perfect for your child’s nursery, play room or a party! Depending on the age of children making this craft, you can choose to use a glue gun, double sided tape or even glue dots. At ages 8 and 9, my kids are well-versed in using a low-melt glue gun; but they never use one unsupervised. Children should always be supervised when using a hot glue gun. 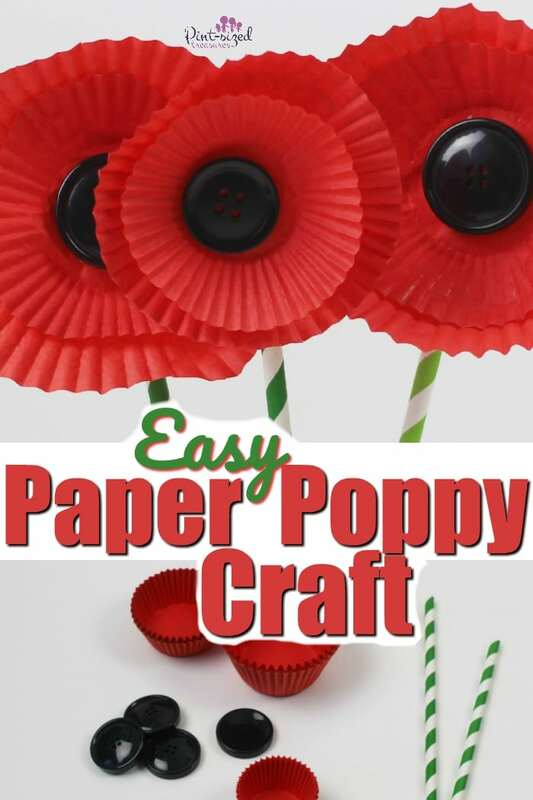 To create the perfect paper poppy (say THAT three times fast! ), we used cupcake liners of varying sizes, but you could also use white ones and color them in. You can also make this poppy flower craft in which you do a lot of painting! 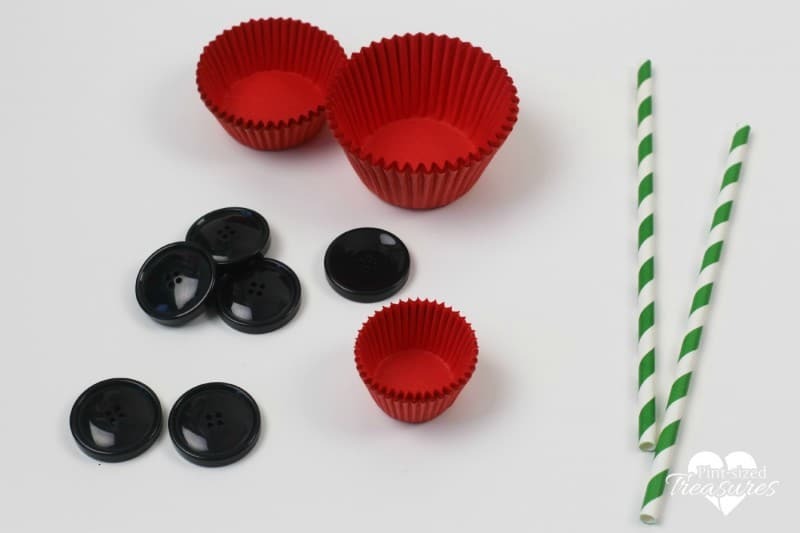 If you only have one size of cupcake liners, you can vary the sizes by cutting off some of the edges. Busy moms have to be resourceful! If you have a difficult time locating some cute, large buttons, then color the center black with pen or paint instead! Possible problem solved! Start my cutting a wavy edge on the largest size of your cupcake liner. Then do the same on the smaller one (or cut a larger wavy edge if you only have ones of the same size). This is a great way to reinforce your child’s scissor skills, even the younger ones as there is no right or wrong wavy line. In fact, the more random the better. Then stick your two cake cases together with the smaller one on the inside before gluing your large black button on. Use this as an opportunity to discuss large and smaller sizes with your kids. We talked about how all the poppies we see are different and not symmetrical. Once the glue has dried, turn over and apply the paper straw with sticking tape. Continue on making as many poppies as you want. You could make a full bouquet that would be perfect as a teacher appreciation gift.